Human Error Caused Virgin Galactic Crash, Investigators Say : The Two-Way SpaceShipTwo broke apart during an October test flight because the co-pilot unlocked a section of the spaceship's tail too early, the National Transportation and Safety Board announced. 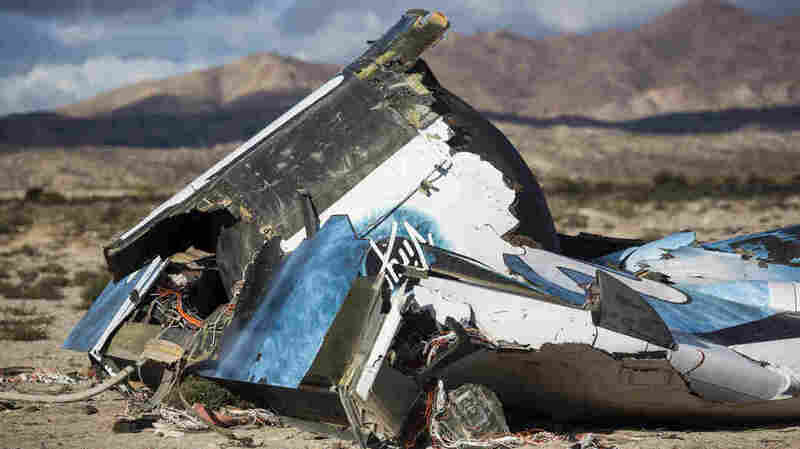 SpaceShipTwo crashed in the Mojave Desert in California on Oct. 31. The co-pilot was killed. The crash of a Virgin Galactic spaceship last fall in California's Mojave Desert was caused by pilot error and design problems, the National Transportation and Safety Board announced Tuesday after a nine-month investigation. NPR's Geoff Brumfiel reports the NTSB found that SpaceShipTwo broke apart during a test flight on Oct. 31 because the co-pilot prematurely unlocked a section of the space plane's tail used in braking. The pilot survived, but the co-pilot, Michael Alsbury, was killed. "But investigators found that SpaceShipTwo's design was also to blame. NTSB board member Robert Sumwalt says proper safeguards to prevent such human error weren't in place," Geoff says. Virgin Galactic's experimental craft was designed and built by a company called Scaled Composites and was intended for suborbital tourist flights costing $250,000 apiece. "Here's how it should work: When the planes reach about 50,000 feet, WhiteKnightTwo drops the smaller craft, which fires a rocket that sends it to the very edge of the atmosphere. Those aboard experience four minutes of weightlessness before SpaceShipTwo reenters the atmosphere. The two pilots flying SpaceShipTwo use the unusual feathered tail system, which changes position from one phase of flight to another to properly orient the ship as it comes back down, with the belly parallel with the Earth's surface. Then SpaceShipTwo coasts back down and lands like a glider." Virgin Group founder Richard Branson said in a statement: "While it is good to have passed this milestone and be able to focus on the future, we're acutely aware this does not alter the fact that this was at heart a human tragedy." According to Geoff, Virgin Galactic says that additional safety systems and procedures have been put in place to protect against accidents in the future.